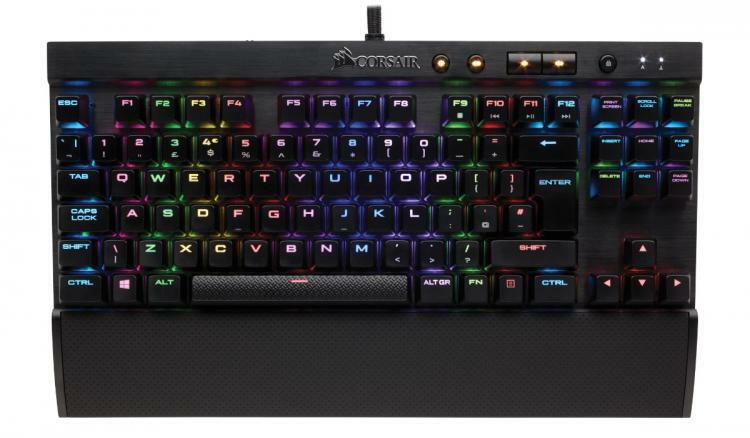 Fremont, California based peripherals manufacturer Corsair and German switch specialists Cherry are once again teaming up, over two years after the reveal of the first CHERRY MX RGB mechanical switch exclusive to the K70 and K95 RGB keyboards. Unlike that reveal however the duo are delving into raw switch performance, almost untouched by Cherry since the introduction of the MX RED back in 2008. The first part of the equation is a new switch design dubbed the Cherry MX Speed, brand new and exclusive to Corsair for the next six months. Cherry MX Speed switches have been developed following feedback from gaming enthusiasts keen to increases actuation speed over the now almost ubiquitous MX RED switches. The new design features a 40% shorter actuation distance over the MX REDs, reduced from 2mm to 1.2mm; however this has been implemented without changing the consistent light-weight 45cN actuation force popular with MX RED. On paper this will reduce the travel time prior to switch actuation proportionately, improving gaming response times for when every millisecond counts. Similar to the MX REDs the first models of the MX SPEED are linear rather than tactile, so the transition from more mainstream models should be seamless. Perhaps understandably the feel of the switch is very slightly different, almost a mid-point between the MX REDs and heavier MX BLACKS, purely down to the reduced travel time. The first generation of MX Speed switches are indicated through a silver shaft on the switch, clearly distinguishing it from the existing red, black, blue etc. models. As with current MX RED designs the switch housing can also be fashioned from black or transparent plastic, making it compatible with the SMD LEDs on RGB switch models. 'MX Speed Silver' (i.e. 1.2mm actuation, 45cN force models) could in theory be the first of a comprehensive lineup which will include tactile and heavier types. The other critical part of the new product equation is a set of new keyboards for these switches, and naturally Cherry's partners are keen to start off strongly. Corsair are rolling out near comprehensive support for the MX Speed switches right from the get-go, with models in both their K65 and K70 lineup. 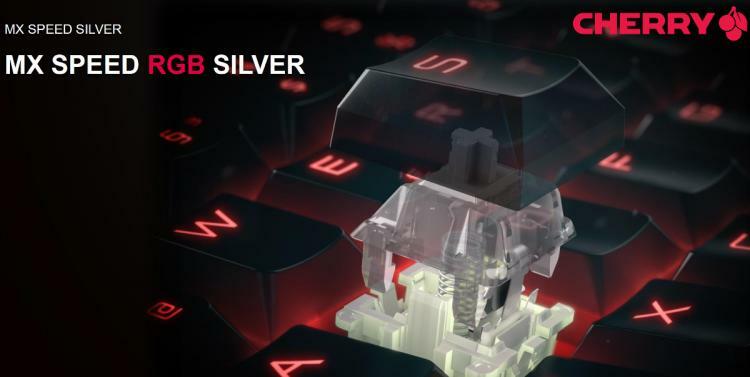 A core part of their premium gaming range, both K65 and K70 models are fully equipped with mechanical switches throughout and cater to either compact (tenkeyless) or full-sized requirements. All Corsair keyboards with the new RAPIDFIRE branding are kitted out with the MX Speed switches. The Corsair K70 RAPIDFIRE and K70 RGB RAPIDFIRE are outwardly identical to existing K70 keyboard models, belying the advancements under the surface. Both are fashioned from the unibody aluminium chassis with a gorgeous black anodised brushed aluminium finish which we so appreciated in our 2013 review of the original K70, but also include the aesthetic advancements made to improve per-key backlight control and dynamic lighting effects. Standard K70 RAPIDFIRE models once again feature the single colour red per-key backlighting present in the original K70, whereas the K70 RGB is equipped with full RBG per-key backlighting. 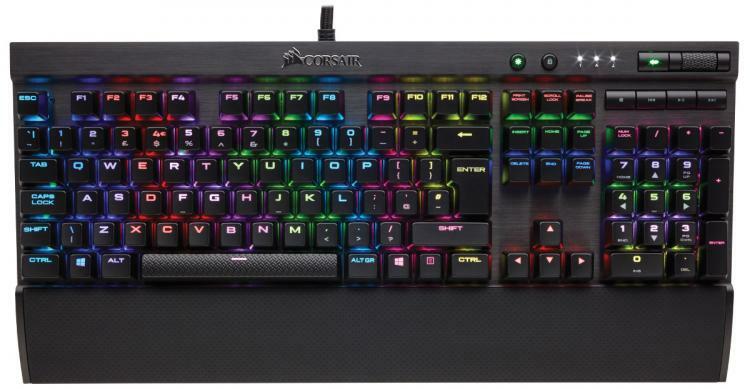 The Corsair K65 RGB RAPIDFIRE is a tenkeyless equivalent of the K70, intended for use where either space is at a premium or the numberpad as unnecessary. With the exception of the numberpad's omission these K65 models are just as well appointed as their K70 brethren, featuring mechanical switches and per-key red or RGB LED backlighting. Under the hood the RAPIDFIRE range inherits the most advanced features which have proved to be so popular with Corsair main mechanical line. Perhaps most important is 100% anti-ghosting and full key rollover over USB, once again taking centre stage at a time when not all manufactures still get this right. Plus, as we've remarked on before, the construction is so solid you could comfortably these keyboards as weapons come a Zombie Apocalypse. In a slight change older K70 models the majority of the keycaps are similar to those on the STRAFE models, and overall we've found that they have a far better feel (although personal preference may change that). The optional keycaps with textured surface once again make an appearance for those who appreciated the choice. A further change is the return of USB 2.0 passthrough, missing from the K70 RGB. It was one of the more significant omissions from the refreshed range 18 months ago, and should be a welcome addition for those who routinely would use keyboard USB or hubs for mice or headsets. Perhaps the most eye-catching feature however are the smart lighting effects which are part of the RGB RAPIDFIRE range. The keyboard now interfaces with the Corsair Utility Engine (CUE) software for profile management, macros and lighting which can be synchronised across multiple Corsair RGB peripherals. New advanced lighting effects are being added all the time thanks to an open scripting system, but one of the more impressive is the ability to show a graphical equaliser effect for in-game audio or current tracks. If you have the opportunity to use any of the Corsair RGB keyboard range we urge you to experiment with this feature, it really is a lot of fun. - 100% Anti-ghosting and full key rollover over USB circuitry: No matter how fast you go your keypresses will always register. - Aircraft-grade anodized brushed aluminum frame: Light weight and rugged durability you need for a keyboard that’s going to see a lot of action. - Advanced lighting control and large font keycaps: Experience dynamic, vibrant multi-color backlighting. - The power of CUE: Sophisticated macro programming and fast, fluid dynamic multicolor illumination for an enlightened gaming experience. - Detachable soft-touch wrist rest: The comfort you need for marathon gaming sessions. - Dedicated multimedia controls: The control you need to adjust your audio without interrupting your game. - FPS and MOBA keycap sets: Textured and contoured keycaps provide maximum grip and enhanced feel. Despite the new switch designs Corsair haven't introduced new costs for the keyboard compared to others in the range. 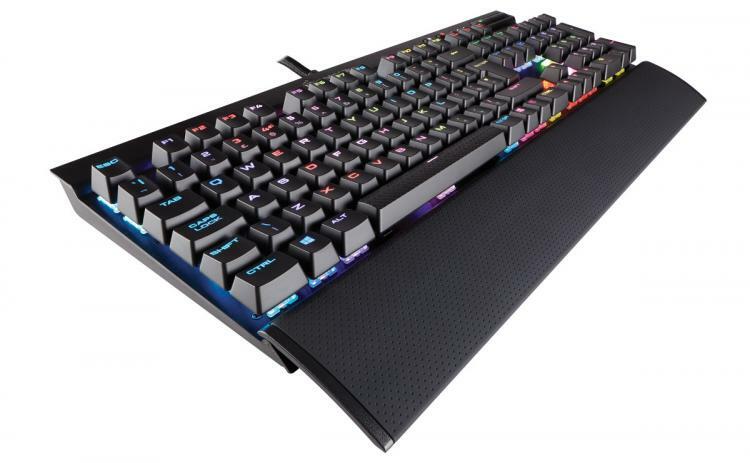 The K70 RGB RAPIDFIRE has an MSRP of £149.99, not at all dissimilar from the current £149.95 cost of an MX RED-equipped K70 RGB keyboard. Both K65 RGB RAPIDFIRE and K70 RAPIDFIRE models are priced at £119.99, making them ideal for those with more discerning requirements or not quite as deep pockets.